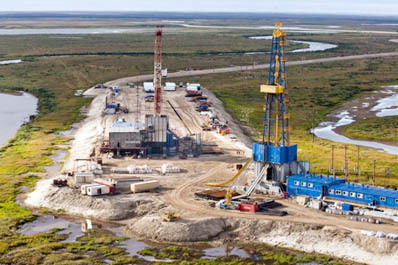 OAO NOVATEK says that the first stage of the Urengoyskoye field within the Samburgskiy license area developed by SeverEnergia (a joint venture between NOVATEK and OAO Gazprom Neft) reached its full design capacity of approximately seven (7) billion cubic meters (bcm) of natural gas and 2.5 million tons of gas condensate per annum. Thirty production wells, including 18 horizontals, are currently in operation at the field. The wells target the Achimov deposits, which are characterized by relatively high depth (approximately 3,700 meters) and high share of gas condensate in the hydrocarbon flow. The field's infrastructure also includes gas and gas condensate treatment facilities, gas gathering lines, gas and gas condensate pipelines for external transportation and housing facilities.